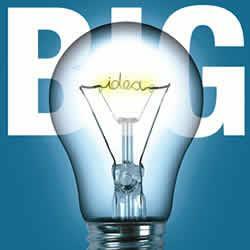 What’s the first thing that comes into your mind when you think of the term, “Big Idea”? When I’ve asked that question before some of the answers I got included Big Macs, Windows, the light bulb, personal computers, the Internet (thanks Al Gore!! ), moveable type (which led to the printing press), the telephone, television, airplanes and Google among others. But Big Ideas don’t have to necessarily be global or world-changing. They can be a new way of packaging a product, a new tag line for your company, a great trade show giveaway or a different way of looking at a process that increases productivity. I’ve sold millions of dollars worth of promotional products over the years, but with the economy being the way it is I decided I needed to broaden my approach. One of the first things companies tend to eliminate from their budgets in times like these is promotional products. I could show them the folly of cutting out what is arguably the most targeted form of advertising available, but logic is not always, well…logical. So instead I’ve taken the other areas of promotional marketing that can impact a business and now incorporate those into finding the “Big Idea” for my clients. It used to be in my initial sales call on a new prospect I would ask a slew of questions and then break out all the promotional product samples I’d brought hoping one of them would be just the ticket for a nice sale. Some people I know call that “showing up and throwing up” in that you show up and throw a lot of stuff out on the table for the client to touch and feel and hopefully buy. But I’ve realized by showing up and throwing up I was doing my clients and prospects a disservice. To be able to target those areas where my expertise can best be put to use I must first perform my due diligence with those I’m calling on. Much of this can be done before I ever step foot in their door through research on the company and individual I’m dealing with. I Google names, I look at websites, I use Hoover’s to gather information, check Linkedin, facebook and any other resources I can think of where I can learn what this company is all about. Are they stodgy, contemporary, big or little? Who are their customers, what’s their mission statement, what does their website look like? Do I see anything negative about them on the Internet, positive? How many employees, how many offices, do they produce a product, do they have manufacturing facilities, how do they go to market? Most all of this I can learn simply by spending an hour or so on the web, but that’s the big picture. To focus in on how they go about their business I need to sit down and ask questions of those who I will be working with. I have a list of questions, a rather long list, but I pick and choose those queries that will fill in the blanks from my research. Direct questions like, “What is your overall marketing goal this year?”; “How will you know when you’ve achieved it?”; “If you could only use one form of marketing, what would it be?”; “Do you have a safety program in place?”; “Do you use direct mail and if so, for what purpose?”; “How do you recognize and/or reward employee performance?” The key is in my first meeting I don’t take anything with me other than a notepad and possibly a small thank you gift for their time. And I limit my time to 21 minutes and actually set an alarm to go off. I want to be respectful of their time and so I key in on only five or six key questions based on my research. With those answers I can go back and look at the areas I believe are critical to their continued success and put together what I believe are a few “Big Ideas” that can help ignite and propel their marketing efforts. These could be in the areas of HR, trade shows, direct mail, customer engagement, safety, sales or any other areas critical to achieving the goals I learned about in my research. The bottom line for me is that “Big Ideas” usually come about as the result of a deliberate process. Showing up and throwing up as most promotional product sales people do (and as I used to do) is not the way to gain long-term customers. It’s a sure-fire route to selling products on price and I can rest assured there is always someone who has a lower price than I do no matter what the product is. I want to be considered a resource for my customers, someone they can turn to when they have a marketing challenge that needs a jump-start. Not the guy they call when they need a .99 cent mug for .79 cents!! I hope next time you’re in need of a “Big Idea” you’ll think of me and rest assured, a .99 cent mug probably won’t be my first choice of products for you. « Trinkets and Trash or Arts and Treasures? Good post. There are three approaches that are currently used by most sales reps. Buyers today have many choices and those in our industry who commoditize themselves by using any of these as their primary sales process will face increased competition and less demand. I have the best price, best service and I’m your best person. 99% of the industry says the above and are commoditized. A few professionals use a more focused relationship based approach that aims to identify aims and expected returns on dollars spent. This approach takes a lot of work. An approach of asking hard questions of the prospect as to their objective, their goals for the promotion and listening extremely well in order to establish branding, ROI and how the proposed solution fits into an overall strategy will differentiate professionals in the long term. It’s hard work and like any hard work it takes time to show reward but it will differentiate those who have the discipline to do it. Just finished reading “Selling Beyond Value” and it ramps it up even more in terms of our industry. Basically says you should do a lot of research on your customers or prospects and must sell a business fit between companies to the decion maker(s) before you ever discuss product. By selling a business fit; meaning how you can strategically help them meet their business objectives with your services to the decision maker you set your company so far apart from your competitors that price becomes irrelevant. It’s being the 1% in our industry that isn’t selling a commodity or even ideas to begin, but is selling the value you bring as a business partner.